A design concept we have been working on the past year with team rider Jeannette Prince. Based off one of Jeannette's magic hand shaped DT2 Single Fin boards from the 90's. A completely remastered DT2 model that helps bridge the gap from single fin logs to 2+1 longboard models. A great user friendly option for surfers who want to experience the same feelings of a single fin (trim, speed, and glide) with the capability to turn more aggressively than a log if needed. A perfect option for surfers looking for a single fin that can handle bigger waves or steeper sections. Slightly more pulled in outline in the nose and tail compared with the original tri-fin DT2 model. Rails are more pinched and foiled (thinner in tail with harder edge) to help transition into turns. A great all around single fin longboard. 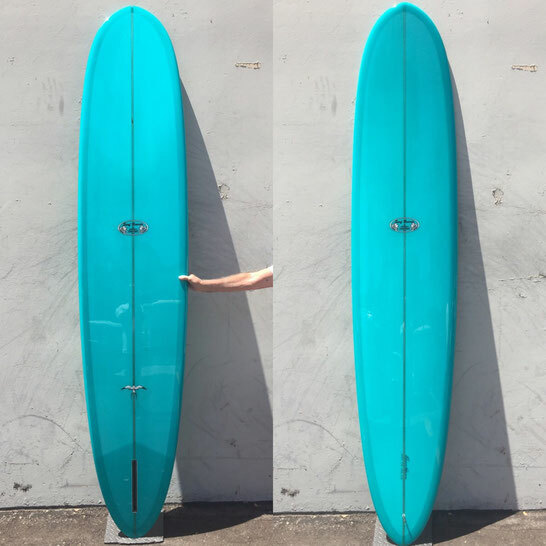 9'2" x 22 1/2" x 2 7/8"